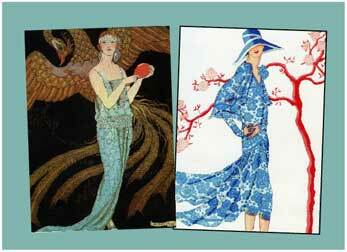 George Barbier and his peers illustrated the best of Paris fashion in the Gazette du Bon Ton, the Tatler and other magazines. These notes feature one daytime and one evening ensemble, each the height of fashion. The set of blank note cards (5” X 7”) comes as 4 each of the two designs w/envelopes.